Because of air quality management and control, traffic-related air pollution has declined in Quito, Ecuador. We evaluated the effect of a city-wide 5-year air pollution control program on the occurrence of acute respiratory illness (ARI). We compared two studies conducted at the same location in Quito: in 2000, 2 years before the policy to control vehicle emission was introduced, and in 2007. Each study involved ~ 730 children aged 6–12 years, observed for 15 weeks. We examined associations between carboxyhemoglobin (COHb) serum concentration—an exposure proxy for carbon monoxide (CO)—ambient CO, and ARI in both cohorts. In 2007, we found a 48% reduction in the ARI incidence (RR 0.52; 95% CI 0.45–0.62, p < 0.0001), and 92% decrease in the percentage of children with COHb > 2.5% as compared to the 2000 study. We found no association between COHb concentrations above the safe level of 2.5% and the ARI incidence (p = 0.736). 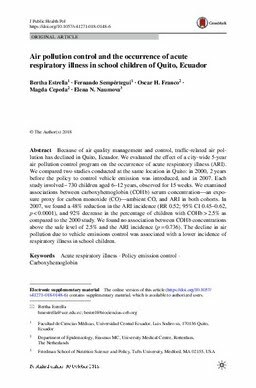 The decline in air pollution due to vehicle emissions control was associated with a lower incidence of respiratory illness in school children.